This is Bruin Radio Sports, featuring play-by-play sports coverage hosted by students and staff of the Brookings-Harbor High School! 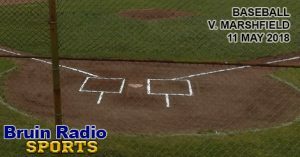 We proudly cover the May 10th doubleheader between our Brookings-Harbor Bruins and the Marshfield Pirates. Don’t miss the grand slam we cover in this episode, and if you’re a player or a friend or family member of a player, definitely check this one out! To see more pictures of the game and its players, check out the Wild Coast Compass article about the game: https://www.wildcoastcompass.com/bruins-win-play-off-spot/. If you’re a student or staff member and you’d like to get involved, or if you’re a community member with input or advice for Bruin Radio, please reach out to us! Email Dane Tippman or Alex Merritt of the Brookings-Harbor High School. We would be thrilled to hear from you! I’ve been enjoying listening to these entertaining play-by-play podcasts of Bruin sports events. I’m not a big sports fan, and have never before listened to an entire on-air broadcast of any sporting event. But, since I’m a fan of Bruin radio, and love hearing what our local students are up to, I started listening to Bruin Radio Sports. Definitely fun to listen to, mainly due to the always entertaining banter by the student and staff announcers. Brookings-Harbor High School definitely has some emerging talent among its student body!